Hello again PlayStation.Blog universe! Since we last stopped by to exclusively reveal the new trailer for Young Thor here back in August, we’ve been hard at work on the next game for all you Sony fans out there. We’re happy to report that it’s nearly complete and most certainly continues our tradition of delivering some of the highest quality and rewarding experiences available on the platform. So, what’s next in 2010 from Frima, the studio that brought you Zombie Tycoon, Widgets Odyssey I and II and Young Thor? The answer lies in the cosmos with A Space Shooter for Two Bucks! With what we feel may be the most appropriate and what-you-see-is-what-you-get (WYSIWYG) titles in gaming history, A Space Shooter for Two Bucks! is what the Frima Studio team has been working on for the last portion of 2010 and is one of the most exciting minis we’ve ever seen. For the ridiculously low price point of – yep, you guess it, $1.99 – it’s also one of the most value-rich shooters ever. And as a bonus, A Space Shooter for Two Bucks! is quite historic – when it launches on Tuesday, December 21, it will also be available absolutely FREE to all PlayStation Plus subscribers, marking the first time a game has launched to the general PSN public and also made free for Plus users on the same date! We’re a big fan of the classic space shooting genre here at Frima Studio, and it’s been a real thrill to create one ourselves and being able to add everything we love about space shooters and omit everything we don’t. A Space Shooter for Two Bucks! features everything you’d expect: swarms of enemies filling the screens with hazardous bullets and missiles, heaps of upgrades for your ship and its arsenal, high-paced and constant action requiring deft reflexes, and hordes of alien baddies just waiting to be blown up by your superior space-faring skills. A Space Shooter for Two Bucks! also contains some truly colorful characters that you’ll get to meet during gameplay and cutscenes. 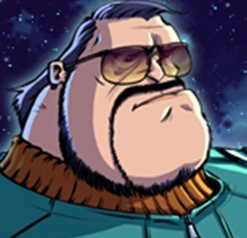 You’ll wipe the galaxy clean of nefarious extra-terrestrials by taking control of Commander P. Jefferson, a truly patriotic earthling who has vowed from an early age to keep the human race number one in the universe, where it belongs! 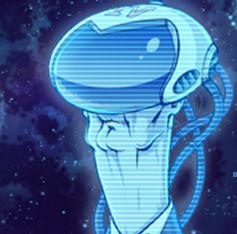 His xenophobic quest is assisted by Edgar, his ship’s somewhat persnickety artificial intelligence (AI) that guides Jefferson to various galaxies and provides helpful information, but always with plenty of snobby sarcasm piled on his replies. 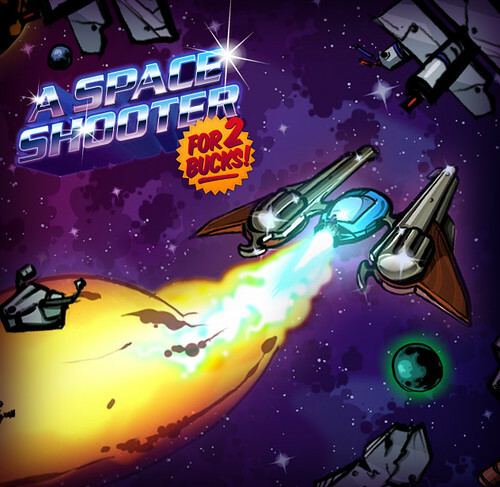 We’re also proud to report that A Space Shooter for Two Bucks! features a complete soundtrack of full voiceovers for Jefferson, Edgar and all the rest of the characters you’ll encounter throughout your journey, both good and evil. We’re excited to have a team with the technical expertise and experience with this platform to be able to squeeze full voiceover into a game that looks and plays fantastically and will give you hours of intergalactic enjoyment in a package under 100MB. Again, A Space Shooter for Two Bucks! launches on Tuesday, December 21 for $1.99, so keep an eye out and stay tuned to the PlayStation.Blog for more information and assets. Happy alien hunting cadets! The name is even BETTER! Can’t wait to try this game. Is this a shooter? For Two Bucks? Best name ever! Is there a video somewhere for this game? I want it now! Sweet! Any trophies for this??? or am I expecting too much for $2? love the name. just got young thor so if i like that i’ll snag a space shooter for two bucks! Everyone should take notes, great price, great looking game = SOLD! P.S. I just saw that it’s FREE for PLUS Members! REALLY PEOPLE IN THE INDUSTRY SHOULD TAKE NOTES!!! Wait, shouldn’t it be called “A Space Shooter for 2 Bucks or Free for Playstation Plus Subscribers”? It says that’s it’s a mini game. Can I play mini game on my PS3 ? Where can I find more informations about how mini games works ? Yes you can play it on your PS3. Minis are designed for the PSP but they work perfectly on the PS3. There’s a Minis section in the Playstation Store, that’s where you’ll find the game. Will we be able to get some footage of the game in action? I’d like to see how it plays. Also, how many stages, are there power-ups, things like that. I was really excited about this until I read that the price would be $1.99 instead of $2. Demo? or is this a mini? Well, it’s about time! Now look out, you alien scumbags! I’m pissed, I’m armed… and I’m two bucks away from blowing you to kingdom come! Hey I know this game will be worth 10 times its asking price and its a day one for me! all this only for a free mini?! I don’t care if it’s 2 cents. If it’s not on disc, it’s not worth buying. This is probably the worst comment I ever heard. You have to be kinda ignorant to say that. Anyway, it’s not like my comment will change your point of view so go on and miss all the great stuff that is only available in downloadable form. i just signed up for ps plus and im loving it more and more with each announcement!! Einhander138 (28) always complains like that whenever there’s a digital-only release. He’s stuck in the previous generation of consoles. A game like this could never exist were it not for digital distribution models. What, are you seriously going to resell a game like this a year from now? What are you going to get for it, a dollar? You’re paying for entertainment, not an investment. I love the “playsation plus is starting to be worth every dollar” comments. What, all two of them? Not that it’s not worth it, but really, this game being free isn’t saying that much. I want to see Two Dollar Brawler come next from these guys. So – I’m confused. Just what sort of game is this, anyway? And what sort of price should we expect to pay for it? It would really be nice if, someday, games would have more accurate and descriptive names. Thanks for all the great comments guys! We’re pretty proud of this one and we are convinced that you will love it. Take a look it should answer some of your questions.